This very rare Spanish-Philippine coin was sold for 15, 500 euros as lot 1083 in the December auction of Cayon Numismatica and is considered as one of the most elusive coins of Philippine numismatic. The coins of one and two cents of weight, minted in Madrid at the hands of Bartolomé Maura, were made by order of 15 December 1893. The Decree refers to "lack of copper currency adjusted to the legal system" which encourages coining full retail. Shall be "the new pieces of copper one and two cents of weight, equivalent, as the silver 10 and 20 cents, which circulate in the Peninsula (...) Most all of these fractional coins will be legal tender only in the territories that are dependent on the General Government of the Philippines". The initiative was just one of the so many in the pipeline, but that Maura, the newly appointed general engraver, left us a few pieces by way of historical testimony. The magnificent bust with riotous hair, appears on these coins, still better than weight. It is perfectly proportioned (especially the two cents) and technically perfect. 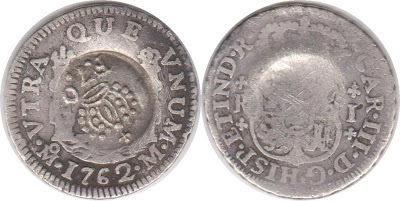 It is especially curious that even having the permission of the Crown, coins on the same Islands were not coined under his name and it was even struck in Madrid, marked with a Pentagram. Perhaps because of insecurity or lack of larger machinery (remember the diameters of the cash of the father, 10, 20 and 50 cents, and clear, 4 weights) where carry out works such as these that we present. We assume that he just followed the guidelines given in the Royal Decree of December 15, 1893: "...Article 1. It is authorized the temporary opening of the Casa de Moneda de Manila, for the coinage which are necessary in the territories of the Government General of the Philippines, without prejudice of the Casa de Moneda de Madrid, to use when it's convenient to the best service..."and"...Section 3. This will be limited for now, fractional silver coin in 50, 20 and 10 cents of weight parts and bronze coin adjusted to the decimal system in parts one and 2 cents of weight..."
According to estimates, these coins exist only in two values, with no more than ten or twelve mintages. Preserves the archaeological museum in Madrid two parts of a penny and three two (one of them Sastre collection proceeding). These coin has never been in the market in the last decade and was only recorded sold in the Philippines once decades ago. Counterstamped minor coin is one of the hardest to acquire in the hobby of collecting counterstamp coins. Dr. Pablo De Jesus and Dr. Fortirch have listed counterstamped minor coins among the top variety of counterstamp coins that are hard to come by in the market. Among the four (4) denominations other than 8 reales, only three (3) namely: four (4) reales, two (2) reales, and one (1) real counterstamped coins have appeared in the market since the collecting began in the early days of the 20th century in the Philippines. Among them, only the four (4) and two (2) reales have been documented to bear both King Ferdinand VII and Queen Isabela II mark while only specimen bearing the counterstamp of Queen isabela II appeared in the one (1) real coin. No half (1/2) real coin was known to exist bearing either of the two reigns. Among the counterstamped one real coins, none were struck on coins dating the 1700 period and those that were reported to surface only bear the reign mark of Queen Isabela II. Very rare are the "dos mondos" or the legendary two pillar coins having marks of either of the two reign in any denominations. Seeing a one real "dos mondos" bearing the mark of King Ferdinand VII is really magnificent and breathtaking because this is truly another great discovery in the realm of Philippine numismatic. The specimen bears the 5-4-1 pearl and minted in Mexico. New Jose Rizal one-peso coins the Bangko Sentral ng Pilipinas minted to commemorate the 150th Birth Anniversary of the country’s national hero have begun circulating through the financial system. The coins are of the same size and weight as the one-peso coin now in circulation —24 millimeters in diameter at 5.35 grams. On the side of Rizal's portrait is etched "150 years" and "1861-2011". On the face of the grayish, nickel-plated coin is the portrait of Rizal, with the words “150 years,” “Republika ng Pilipinas,” and the years “1861-2011” etched on it. 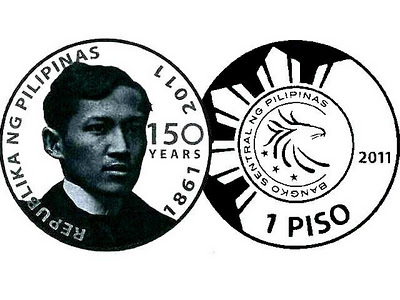 The reverse side carries the new BSP seal, “1-piso,” and “2011”. The new Rizal coin still inherits the qualities of the previously minted 1-Piso coin which is magnetic. This is in relation to the government's counter smuggling policy where 1-Piso were being smuggled to China for its metal content especially copper. But unlike the new paper bills, which were found to contain various inaccuracies in their depiction of Philippine wildlife and geography, the new Rizal coin has so far met no serious criticism from the general public. Some are asking, however, why they were issued towards the end of the 150-year celebrations and not, say, on Rizal's 150 birthday itself, June 19. Others have questioned why Rizal adorns a low-value coin. But lower denominations are usually thought to signify greater stature because of their wider circulation. There was a ripple of controversy some years ago when Emilio Aguinaldo replaced Andres Bonifacio on the five-peso currency. Bonifacio's visage now shares the ten-peso coin with Apolinario Mabini's, which some may think is a step down for the father of the Katipunan, who was executed in a power struggle with Aguinaldo. BSP spokesperson Fe M. Dela Cruz told GMA News Online that as soon as word got out that the new coins were going to be issued, the central bank got a flood of inquiries and requests for allocations. Piloncitos is the earliest form of precious metal based currency of the Philippines. It is likely made of pure gold with a weight ranging between .5 grams to more or less than 3 grams. Piloncitos is not exclusively found in the Philippines as most collectors and local historians have agrees. Similar type of gold can be found in some regions of Indonesia which they call massa. The earliest written account of Piloncitos was made by our national hero, Jose Rizal himself. According to Rizal, he found the gold nugget while tilling the soil of Dapitan. He himself coined the word piloncitos, which basically describe the coin's unusual shape. They are round and stamped with what looks like the pre-Spanish baybayin character “ma,” leading historians to guess that it could be short for “Ma-I. Even before the Thai moved southward from their original home in China, the lucrative sea trade between the South China Sea and the Bay of Bengal established several maritime empires such as Sailendra-Srivijaya and Majapahit, which controlled coastal areas of modern Indonesia, Burma, Malaya, Thailand, Vietnam, and the Philippines. In an era before coined money was widely used, Indo-Pacific beads were made first at a site called Aakmidu in South India ca. 200 BC. The manufacture then moved in sequence to Ceylon, South Thailand, Java and finally Malaya. By about 1200-1300 AD the larger Majopahit beads, excavated today in the interior of Java, had supplanted it. Since these factory sites have been dated, archaeologists now use the beads to date sites, though whether beads rose to the level of metals, salt, cloth, and cowries as "standard" trade goods is uncertain. The first indigenous metallic coinage in the region, ca. 750-850 AD, comes from the Javanese kingdom of Sailendra (Chinese: Ho-ling). These roughly dome-shaped silver of irregular weight bore stamps of a flowing vase, and the sandalwood flower (quatefoil). By 850 AD weights had been standardized at 20 rattis to a Massa of about 2.4 grams. Silver and gold coins of Massa and fractional denominations were issued until about 1300 AD, with changes in shape and quality of inscription marking periods of issue. The gold Piloncitos of the Philippines are a late offshoot of the gold coinage, while the beanlike silver "namo" series, of the Malay isthmus was presumably an offshoot of the silver and may have evolved into the bullet (pod-duang) coinage of Sukothai in Thailand. Past local numismatist like Dra. Anita Legarda and Gilbert Perez made some research regarding this coin but only few specimen were found and no further study nor specimen have surfaced recently aside from those what have been found. What fascinates historians and numismatists alike is why piloncito can only be found in the Philippines and unlike its counterpart gold massa that are vastly present in the Southeast Asian region. Money talk brings about certain moods. We get sad and irritated when there's a lack of it, giddy when we receive crisp bills as "pamasko," proud with a glint in the eye when we have too much of it, and always frustrated when the bills have to be paid. But during the Jose Rizal Lecture at the 2011 Philippine PEN (Poets and Playwrights, Essayists, and Novelists) Conference, historian and author Ambeth Ocampo made his audience smile without throwing cash at them, instead making them ponder about how our banknotes—the "common, everyday things" we fish out of wallets and pockets—speak about us Filipinos. Ocampo, considered an "expert" on all things Rizal, called bills and coins "calling cards of a country." "They tell a story, they're an official view of history," he said at the conference held at the Cultural Center of the Philippines last December 2. "But banknotes are such common, everyday objects that we don't notice them." When we do, it's to criticize, he said, noting how the New Generation bills launched last year drew flak for "faulty" designs, particularly the "geographically wrong" map of the Philippines printed at the back of the 1,000-peso bill. Ocampo, who was "the only outsider" on the Numismatic Committee of the Bangko Sentral of the Philippines (BSP) that recommended approval of the bills, offered in good humor: "You can blame me," which he withdrew by saying "I'm always consulted but I'm never really listened to." And while he agreed with President Benigno Aquino III, who countered criticisms by noting that you wouldn't consult a thousand-peso bill for directions, the historian pointed out that these little matters—like lost islands that you won't notice in a map at first glance—show how unsure we are of ourselves, especially in our claim over territories like the Spratlys and Sabah. "Just to show you how different we are from Indonesia: the back of their 100,000 bill has a map. When you look at [it], the map in their money has Papua New Guinea and Malaysia in it. They actually claim it. They're very secure about themselves and what they own. In the Philippines, not only don't we know the exact number [of our islands], we also don't put disputed territories in it," he said, adding that what goes into the map is something that "should be discussed." Ocampo also discussed the faces that defined our currencies, which he said reflected "what we tend to think of ourselves." He shared the pitch he made when he was first told about the BSP coming up with the new generation currency: get rid of all its current "faces," replace them with "people who are younger—no more 19th century heroes." "And I said, 'Why don't we put artists and writers?' The Central Bank, of course, said no. They refused to look at it," he said. "It would have been a way for people to learn about their artists and their writers." Saying that they didn't have time with the buzz of the upcoming elections, the BSP retained all the faces in the notes—save for the inclusion of former President Cory Aquino in the 500-peso bill and the removal of Gloria Arroyo at the back of the 200-peso bill. Regardless of whether Rizal's presence in the one-peso coin is a step down or a mode of remembrance, Ocampo noted the result of a Social Weather Stations (SWS) survey conducted early this year, which showed that "as far as the people are concerned, Rizal is their National Hero." Ocampo noted that Rizal led "by a huge margin" of more than 80 percent. His "contender," Bonifacio, was "a far third" with only 1.9 percent. But he said Filipinos should stop making the National Hero title such a competition among the 19th century heroes. "Rizal, Bonifacio, Aguinaldo—they are all national heroes. It's not about asking young people 'Rizal or Bonifacio,' but telling them, 'You have two heroes. You have Rizal and Bonifacio,'" he said. Ocampo also zoomed in on the fact that sandwiched between these 19th century figures was pound-for-pound king and Sarangani Rep. Manny Pacquiao, who got 2.8 percent. "When you look at the list of names, there's Erap (former President Joseph Estrada), FPJ (Action King and presidential candidate Fernando Poe Jr.), Chiz Escudero... So you have to ask yourself, who names these heroes and why do the people consider them as such?" he added. As his lecture came to a close, Ocampo expressed his hopes that "common things" like banknotes would "make us appreciate—or not appreciate—people." The Bangko Sentral ng Pilipinas will introduce into circulation a hundred million new generation currency (NGC) banknotes in time for the Christmas holiday season when crisp peso bills are all the rage, especially with children who get money as their aguinaldo. These peso bills will be added to the almost 300 million currency notes already in circulation. Recently, the New Generation banknote won a top international prize in a recent design competition held in Singapore. Despite the effort of the government to familiarize the public regarding these notes, several complains are being received by the BSP including the notes unattractive design which can be considered ironic in spite of the recent award it bagged. The public is also being warned that counterfeit money will be out again in mass this holiday. People are being to be cautious and scrutinize bills passed on to them especially those of higher denominations.